The combination of chocolate and cinnamon make these cupcakes kind of taste like a coffee cake, hence their name. When measuring the coconut flour, be sure to break any clumps in the flour with a fork (or a sifter, if you have one) as breaking down them down while mixing it into the batter can be very hard! Hard as in, it can take longer to mix the batter so as to make sure that any clumps are broken down and completely mixed in the batter. Clumping in coconut flour is different from other kinds of flours such as rice flour or almond flour as it is compact, plus coconut flour absorbs moisture, which is why so little is needed. The chocolate sauce can be made in advance. If you want the cupcakes a bit sweeter, increase the honey to 1/3 cup. Preheat oven to 350ºF. Line a standard muffin tin with paper cupcake liners. You may wish to have a layer of two cupcake liners for each cupcake, depending on the opacity of the paper (the area where the batter was becomes visibly darker, with the paper where the batter did not touch starkly contrasting). Beat the egg whites with the salt and lemon juice until soft peaks start forming. Pour in the honey and add the beaten egg, gently folding into the beaten whites. Mix in the chocolate sauce. Fold in the coconut flour, cocoa powder, spices , almond extract, and coconut oil with a spatula, preferably flexible. Fill the cupcake liners almost all the way to the top, a little over three quarters of the way full. Bake for 25 to 30 minutes, or until a toothpick comes out clean and the cupcakes’ surfaces “bounce” back when touched. Cool thoroughly before icing to prevent it from melting. 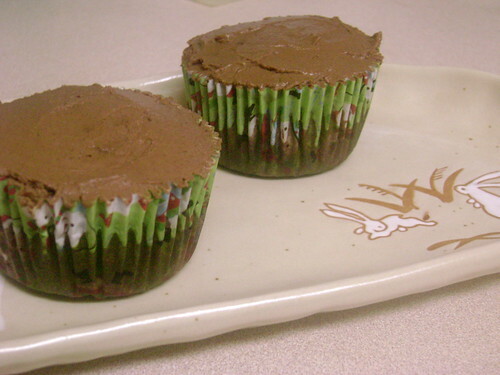 Once the cupcakes have sufficiently cooled, generously spread some of the chilled chocolate sauce on the top of each cupcake, spreading more on as needed to cover the entire top. Serve and enjoy! Hi Karen, I haven’t used xylitol and Googling how to replace honey with xylitol isn’t conclusive…the best advice I can give is to experiment at your own discretion. I don’t know if xylitol is sweeter than honey, so I’d start with a small amount and work from there; taste as you go along. Good luck! I am almost finished mixing up the batter when I get to the end but realize I have not used the coconut oil! What is it for? I can only assume it is for greasing the cupcake pans if I dont have liners??!?! Xylitol isn’t nearly as sweet so I went with 1 1/2 times the honey. Ill let you know how it goes. Hi Karen, I hope it works for you. 🙂 I forgot to include the coconut oil in the instructions…it’s used for moisture (like butter would, if this recipe used butter).